This feels like a very timely novel, despite that it was written over sixty years ago. A world-weary reporter works in Indochina, waiting to die. His time writing for The Times in this warzone is essentially an inefficient method of suicide, and he lives with a young local woman whom he knows he will likely abandon eventually. He loves his new country but hates the world it occupies. 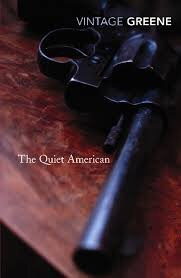 In enters a quiet American, Pyle, a naive young man with big ideas about democratising the country with a third force, who could rise up and end the conflict.